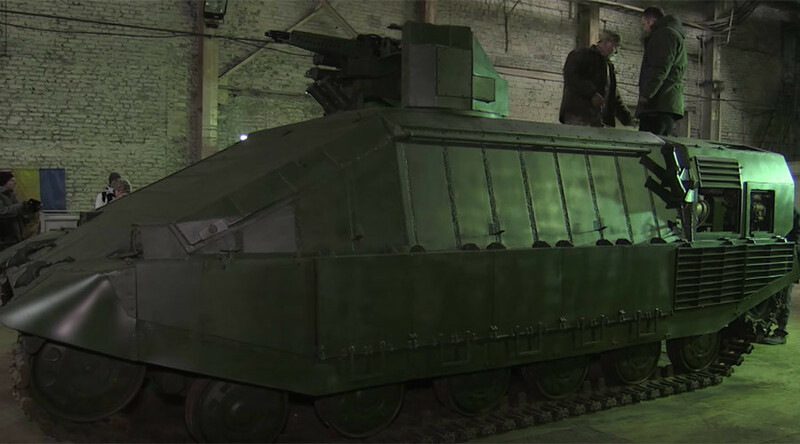 Ukraine has unveiled a new tank, which it hopes will help turn the tide against rebel forces in the east of the country. However, not everyone has been praising Kiev’s latest creation, which has been made using everyday materials. It certainly tanked on Twitter. The rather peculiar tank, known as the Azovets, has been under construction since April. It started as an online project, which saw specialists from around the country participating in its design. “Last year there was the need to create a tank, which would be able to operate in urban areas,” Internal Affairs Minister Arsen Avakov said on Saturday, as quoted by the UNN news agency. “We were called upon by the cities that were fighting with the terrorists, such as Mariupol, where Andrey [Biletskiy] was conducting an operation. After Slavyansk and Gorlovka, which are still controlled by the bandits, we looked at whether we could create an urban tank,” said the Ukrainian minister of internal affairs, despite the fact the Minsk Peace Agreement is largely holding and that eastern Ukraine has remained relatively peaceful over the last few months. Andrey Biletskiy, a former head of the ultra-nationalist Right Sector group, said the tank could help save lives. “It is an ultra modern tank and has greater firing capacities. It will increase the chances of the soldiers staying alive,” he said. However, not everyone has been as positive about the Ukrainian Army’s new creation. It is also not certain how much protection the new tank will be able to give those operating it, as its armor is a mere 40mm thick. Dmitry Rogozin took to Twitter and noted the tank’s armor looks oddly similar to rubbish containers widely used in Ukraine and Russia. “Ukraine has managed to create a new tank out of trash containers,” Deputy Prime Minister Rogozin wrote. Other social media users were equally amused. “You have not seen our new innovative indoor tanks yet,” said another Twitter user. Ukraine is currently experiencing an economic crisis of catastrophic proportions. According to statistics from the International Monetary Fund, Kiev’s economy will contract by a staggering 12 percent in 2015, while Kiev’s external debt is expected to reach 153 percent of GDP in 2015, and 134.2 percent in 2016. In the wake of Kiev’s new tank, Twitter users have come up with other suggestions as to how the Ukrainian government can strengthen the country’s armed forces. This user recommended how Kiev could strengthen its air prowess. Kiev’s new creation is certainly a far cry from Russia’s Armata T-14 tank, which was unveiled on Victory Day on May 9 during a parade in Moscow. With an armored capsule for the three-man crew, the tank is notable for having an unmanned turret equipped with a remotely controlled 125mm smoothbore cannon and a 7.62mm machine gun. In fact, due to its new-generation turret, and field of vision derived from HD cameras and sensors mounted all around, the Armata is well on the way to becoming the first unmanned battle tank, according to sources in the Russian Defense Ministry. Only limited modifications are necessary to turn it into a ground-drone.